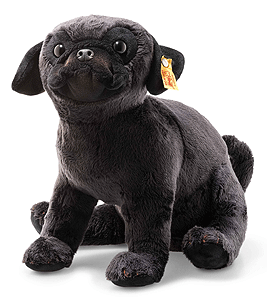 Perry Pug Dog is hand made in the finest black cuddly soft plush and wears the famous Steiff trademark, Button in Ear along with the yellow tag. The 24 cm tall Perry pug dog is always an eye-catcher. An airbrush technique has been used to give the soft and cuddly black plush fabric its highly realistic look. The paws, ears, eyes and the area around the mouth are made of shortened black plush fabric. Intricate stitching forms his jowls. His nose is made of high-quality plastic. Pink airbrush work was used to refine the inside of his ears, his rear stomach area and his claws. His cute little docked tail tops off his charming look.